Building men who will in turn build lives, homes, and churches for the Lord Jesus Christ. …is to promote Spiritual growth, moral fidelity, doctrinal purity, and Biblical responsibility among our men through genuine Christian fellowship, annual retreats and workshops. Our purpose, at Iron Men Ministries is to build men who will in turn build lives, homes, and churches for the Lord Jesus Christ. IronMen Men’s Ministry is dedicated to helping men become the spiritual leaders that the Lord calls them to be. Accountability, bible study, fellowship, and prayer all contribute to the goal of this ministry, with direction from the Holy Spirit. IronMen meet to encourage and challenge each other to live a life passionate for Christ. 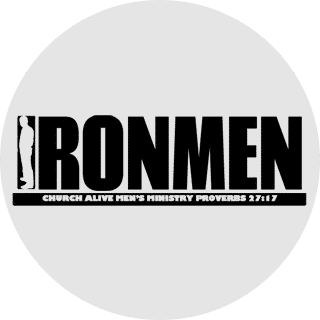 Ironmen Men’s Ministry is composed of sons, brothers, husbands, fathers, and grandfathers who love Christ and have a passion to become the man He wants us to be. We want to grow relationships with other men so we can sharpen each other in our walk with Christ. It is about being REAL with each other. Our IronMen Men’s Ministry is dedicated to helping men to become Christ-like men. A Christ-like man is a servant, a servant of God’s church, a servant of his family, a servant of his community. Our Purpose is to define authentic manhood. In our society, being a man is confusing. There are a number of definitions according to the world’s standards. We look at the Biblical call to be a real man as one who rejects passivity, accepts responsibility, leads courageously and invests in eternity. The purpose of IronMen Men’s Ministry at Church Alive is expressed in Colossians 1: 28 “That we may present every man complete in Christ.” What does it mean to be “complete in Christ” as a man? To be complete in Christ means that we are happy in being a man! We provide for our families. We provide for our family, fight for righteousness sake, have close male friends that sharpen (encourage) us and are faithful to God, Family and Friends.